I’ll be honest: the first time I read this book I had two major issues with it, the first being the flashbacks. There are four (I think) different time frames/points of view, and I initially felt these to be chaotic, distracting and occasionally repetitive. I felt that they detracted from my enjoyment of the main story by disrupting my sense of time and place. I got that they were being strategically placed to build towards the big reveal, but felt that there was too much back and forth within the narrative. Having read this book a second time, I find it difficult to reconcile my initial response with what I’ve just read. For a start, I realise that the sense of dislocation is deliberately evoked in order to create an empathic link with Jorg: we feel but a tiny fraction of what it must be like to be suddenly hit by a memory you have no recollection of having lived through. Secondly, the ordering of the flashbacks is anything but chaotic. The narrative is artfully constructed so as to reveal crucial plot points at strategic moments, as well as to both shock and tease the reader; and what I had at first thought to be random revealed itself instead to be a complex web of memories cunningly fashioned by the author in a way to make one gape with admiration. My other initial problem with the book was that I didn’t enjoy the ‘Katherine’ chapters. I found the saga of her diary entries to be an unnecessarily dull counterpoint to Jorg’s narrative, and found myself wishing her journal pages had never been found. Of course, reading the novel again made me realise why her chapters are a vital part of the on-going Sageous plotline, and her sad words resonated far more poignantly because I was aware of how it was going to end. It's also nice to have a female voice present in the story, and I’m much more willing now to accept Katherine as a necessary part of Jorg’s tale. Prince Orrin is everything we’ve come to expect from a traditional epic hero: he is handsome and moral, gracious and brave, and above all he wishes to secure peace and prosperity for the empire . . . and we spend the entire novel rooting against him (well, I did). I really like the fact that the author has managed to deconstruct traditional fantasy archetypes to such an extent that ‘good’ and ‘evil’ become merely a matter of perspective. Orrin is the golden fairy-tale prince, and yet somehow our Little Jorgy – severely flawed and of dubious morality – manages to emerge as the closest thing to a hero the author will allow. I’ll admit: there were parts of this book that I found difficult to read, and which I know have caused outrage amongst readers elsewhere on the web. A scene which I’ll refer to only as the Justice of King Olidan actually hurt me to read, even more so the second time because I knew it was coming and was powerless to stop it; and yet, I found myself elated that Jorg was able to re-live the memory and re-evaluate the lessons he thought he’s learned from the experience. The fact that the reader is made to experience such anguish is a testament to the author’s ability to create characters and situations he can feel strongly about, and to write in a way that makes others feel this way too. I don’t want to mislead anyone into thinking that this is some kind of sappy coming-of-age drama, by the way. 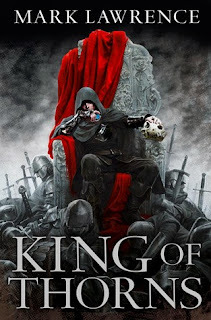 I mentioned in my review of Prince of Thorns how the first book came under fire by those who were outraged by the immoral actions of the central character within the first few pages; if those same people have decided to read King of Thorns I’m guessing they’re currently rolling in their graves after choking on their own moral indignation. There’s some dark stuff here, darker than the first book, with enough creepy situations and haunting images to give you nightmares for a month. There’s battle-action – lots of battle-action! – and the flashbacks are written in the present tense, which really draws you into the moment and uses the “elephant of surprise” to keep you on the edge of your seat, right up to the eventual reveal of the final heart-breaking secret. How can anyone read that without shivering with anticipation? Click here to buy King of Thorns on Amazon.